Samsung unveiled the ATIV Q today, a new tablet-slider that runs two different operating systems simultaneously, Windows 8 and Android version 4.2.2 (Jelly Bean). The device sports a 13.3-inch qHD+ display at a resolution of 3200×1800 (275 pixels per inch), with a 178-degree viewing angle, as well as a rather unique hinge system which means it can be used in five different form factors. These include a straight-up tablet, a kickstand mode that reveals a full keyboard underneath, a peculiar ‘floating’ mode that raises the display into the air and a stand mode that pushes the display back onto the other side of the hinge, away from the keyboard. 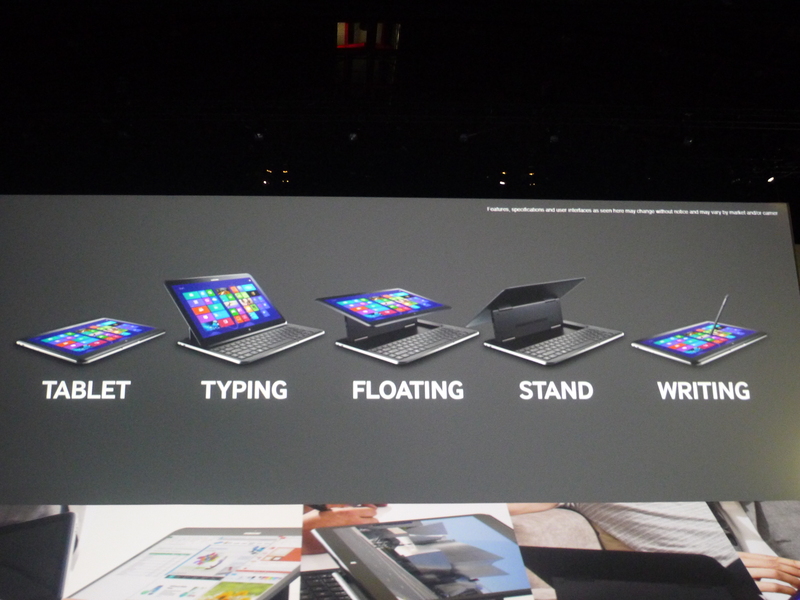 There’s also a writing mode, which appears to be identical to the tablet format, albeit with a Samsung-specific stylus. Under the hood is an Intel Core i5 processor, as well as 4GB of RAM and a 128GB SSD. This is clearly being pitched at the same audience that Microsoft is gunning for with the Surface Pro; users looking for the sort of specs found in a high-end laptop, but in a form factor that can rival the iPad or any other dedicated tablet. The ATIV Q offers nine hours of battery life on a full charge, which isn’t bad considering the processor and high-definition display. There’s also the dual-booting to worry about, which comes with some new software called SideSync to share various data between the two separate operating systems. Microsoft is keen to push Windows 8 as an operating system suited to many different form factors, including a desktop PC, laptop and tablet. It’s clear that Samsung doesn’t feel the same way, however, from its decision to include Android alongside. This has been included, presumably, to offer users a more diverse library of touch-enabled apps. 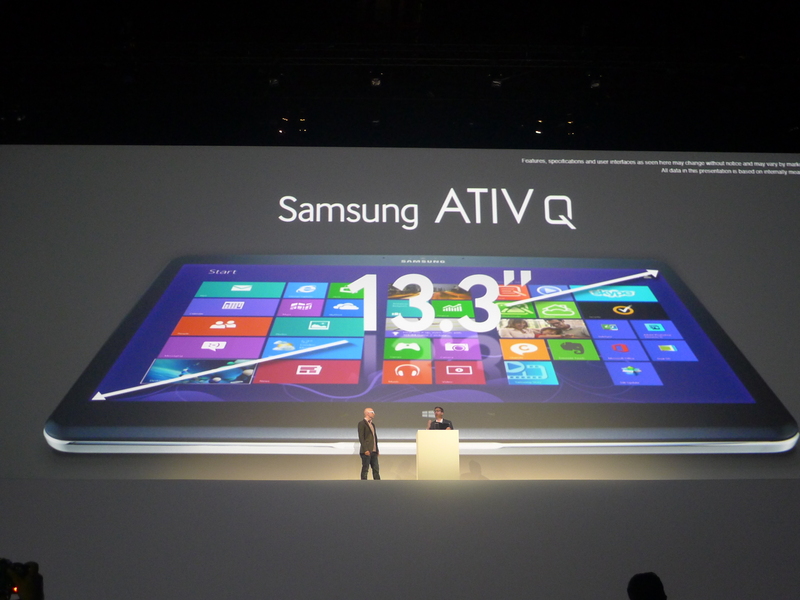 The hardware was unveiled at the company’s ‘Premiere 2013’ event in London, dedicated specifically to new devices in its Galaxy and ATIV portfolio. The company has announced a number of Galaxy smartphones over the last couple of weeks, including the Galaxy S4 Mini, a new mid-range device with a 4.3-inch display, the Galaxy S4 Zoom, tailored to budding photographers with a 16-megapixel sensor and the Galaxy S4 Active, packing the same specs as original GS4 in a more durable body. Many of these devices are expected to be available as part of the preview later in the day. TNW will be on the ground at the ‘Premiere 2013’ event to give our hands-on impressions as and when we have access.